OLY DAYS OF OBLIGATION are a relatively contentious subject among liturgical geeks like me. Questions like: Which days get precedence? Are/Should the obligation be lifted when the day falls on Saturday? Can you “double dip” on obligations (please don’t go down this rabbit hole)? The Solemnity of the Immaculate Conception of the Blessed Virgin Mary hits many of these questions. In the United States, the obligation of several of our holy days is abrogated (made non-obligatory) when the feast falls on Saturday or Monday. While there is plenty of legitimate debate over whether this should be the case, the bishops nonetheless have the authority to lift this obligation. Next year (2014), for example, All Saints will fall on a Saturday, and the obligation to attend Mass will be lifted. 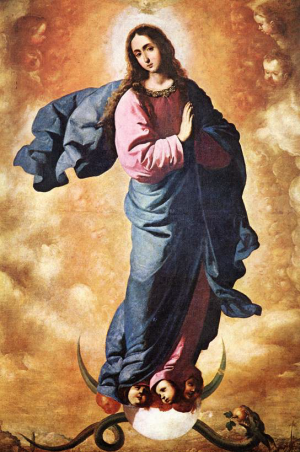 For that principle, though, the Solemnity of the Immaculate Conception is the exception. Even when December 8 falls on a Saturday or Monday, it retains its obligatory status because Mary of the Immaculate Conception is the patron saint of the United States. She holds a special devotion in this country and so is celebrated on any day. The obligation of the faithful to attend Mass remains attached to the day itself (December 8), however, and so it does not transfer with the liturgical observance. This year, the obligation to attend Mass on Immaculate Conception is lifted. I strongly encourage you to attend anyway, of course, since this feast should hold a special place in our devotions as Christians in general and Americans in particular. Tune in next time for some more calendar geekery.